With the new year coming up I am loving trying out new colours on my nails! Here is a colour that I got for Christmas which is a stunning shimmery blue. Read on to see what I think of it! 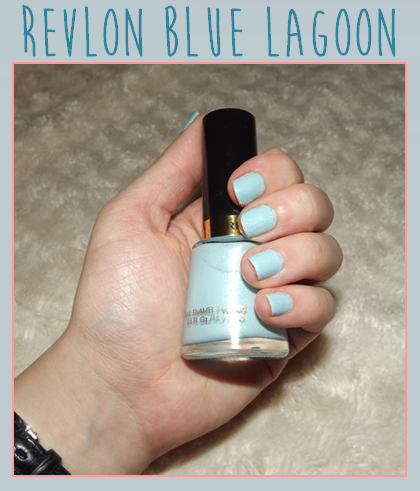 Revlon nail polishes have been a favourite of mine for quite some time, so I was really excited to give this one a go. The shade is 092 Blue Lagoon and is a gorgeous light blue with a built in shimmer. I don't usually buy these kinds of polishes - I tend to go for a plain colour and then add a glitter polish if I want a little bit extra, but it's important to push the boat out every once in a while. The colour itself is incredibly versatile, in my opinion, and can be worn right through the year. Pastels are great for the warmer months and in the colder months this colour gives you the frozen, icy feel. I did worry about how opaque this colour would turn out because of how pale it is so I've had to experiment with my layers. With my first go I did three very thin layers which gave the full colour coverage that I needed, but didn't dry very well. I ended up with dents and scratches all across the polish by the time it dried - three layers definitely wasn't great. The next time I did two, slighty thicker than normal, layers and this worked a lot better. The shimmer is so subtle that it does get lost - it's really not that noticeable unless you look really closely. All-in-all the colour is just beautiful, but the formula could be a lot better and I really wish the shimmer came through more when the polish was on my nails.